What’s wrong with Ec 10? The dozens of Harvard University undergrads who walked out of the school’s famous introductory economics course this month think they know. The students’ general criticism is that Ec 10, in which some 700 students are enrolled, “espouses a specific—and limited—view of economics". Their criticisms are that economics as taught in this class, failed to prevent the financial crisis and does nothing to narrow the gap between rich and poor. They’d like a more diverse intro course that includes exposure to more progressive economic frameworks. The students are correct that Harvard’s economics instruction could use some diversifying. But not the kind they think. Let’s start with where the protesters are correct. First, Ec 10 is a defined and, therefore, limited course. As taught by Mankiw, it conveys modern macro and microeconomics mostly through the prism of capitalism, rather than through socialism or communism. It’s also true that there is a gap in the US between rich and the poor; although whether that’s a problem per se has to be debated. Third, and most important, macroeconomic theory did fail to predict the most recent recession. At Harvard in 2007, many professors and students took for granted that we were in an era of “great moderation", and that life should henceforth progress smoothly down the decades. What the students get wrong is their proposed solution. There are two theories that could have predicted the financial crisis of 2008, and that have much to say about inequality. Neither of them would be considered “progressive". One is a theory laid out by Joseph Schumpeter. Schumpeter warned that capitalism was “by nature a form or method of economic change and not only never is but never can be stationary". Great busts would inevitably follow great booms. Schumpeter inspected the inequality that the Ec 10 students abhor, and liked it: Only when large gains are to be made do entrepreneurs take the risks necessary to create innovative products. Schumpeter’s fellow Austrian Ludwig von Mises noted that credit expansions and booms lead to misallocations of cash. The Austrian School of economics, of which Mises is the modern father, called such misallocations “malinvestment and overconsumption". Malinvestment, in turn, ensures that the boom is doomed. No better example has existed than the money that poured into obscure mortgage securities in 2006 and 2007. But there was no Schumpeter and no famous Austrian School philosopher at Harvard at the time. Harvard is also short of scholars who focus on what is known as public-choice theory. That concept, for which economist James M. Buchanan won the Nobel Memorial Prize, is simple. It says that while government agencies pretend to be virtuous and sophisticated, they are actually as primitive as crustaceans. Government offices will do anything to survive or take away from the private sector. Inequality often coincides with strong growth—it did in the 1920s. In such periods, everyone tends to benefit. When inequality coincides with low growth, it’s more problematic because prospects for lower earners are dim. Two responses are typical. One is to argue that inequality is causing the slowdown and must be reduced. The other is to say the problem is growth, and accelerating it will obviate the pain of the inequality. Both the Austrians and proponents of public-choice theory posit the latter. In assailing Mankiw, the students also miss the mark. Intellectually, Mankiw does sit to the right of some of his predecessors, notably John Kenneth Galbraith, who popularized the interventionist principles of the economist John Maynard Keynes. But Keynes was a complex man, who sometimes fought for intervention and other times defended free markets and trade. Mankiw hasn’t thrown Keynes out the window, like a Frisbee into Harvard Yard. He has merely updated him and presented him in the best light. Look closely at the Harvard protest and you find a problem opposite to the one alleged. Ec 10, though still Keynes-flavoured, does feature intellectual variety relative to the rest of Harvard’s curriculum. 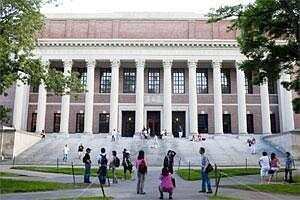 The course’s message of free markets and trade, and less-regulated prices, rings at odds with the ideology on offer in many Harvard courses labelled “history", “sociology" or “government". Add in more Schumpeter, Austrian economics and public-choice theory in Ec 10, and at Harvard generally, and you’ll be offering next year’s freshmen diversity worthy of the US’ leading university.